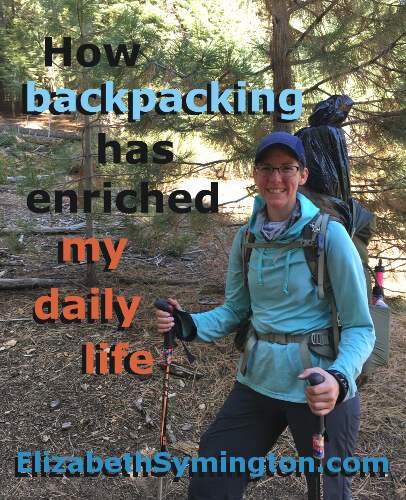 This is Day 26 of the 31 day series on “How backpacking has enriched my daily life.” I expected lightweight backpacking to be a hobby. Instead it has transformed me for the better. I intentionally seek out activities that will help me to stand up straighter, like practicing martial arts, salsa dancing, meditating, playing the guitar and backpacking. Carrying a backpack has helped my posture. I can’t seem to force myself into remembering to stand up straight just for the sake of it, but if it affects my performance doing another activity, then I’m more aware of my posture. Whenever I am backpacking and I start to feel really tired or my neck or back are sore, I check in with my posture. Typically the pain is caused by me hunching forward. That’s when I’d take a deep breath, roll my shoulders back, lift my head and push my chin down and back and try to relax into that position. I believe posture is the key to my inner power. The more relaxed I am with correct posture, the stronger and healthier I will be. I am grateful that being a backpacker is helping me with my goal of becoming effortless and powerful in my movements.